Editor’s note: our colleague Michael J.L. La Civita is traveling through the Caucasus and filing periodic posts to Facebook. Some initial impressions and pictures are below. He hopes to file a more complete report from Tbilisi tomorrow. 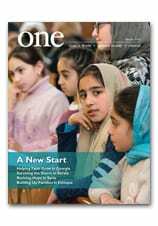 In the meantime, for more on life in that part of the world, check out the story Staying Power, on Georgia’s Armenian Catholics, in the Autumn edition of ONE. Before we set off to the southwestern portion of the country — a wretchedly poor and underserved region — I wanted to share a few pictures from yesterday: terrific folks doing great work for the poor, homeless and poor children, penniless pensioners and the indigent. CNEWA has been supporting these efforts for years, though many are now self-sufficient. Today we traveled about a hundred miles southwest of Tbilisi to a land where time has stood still, even here in Georgia. We climbed the Caucasus Mountains about 12,000 feet above sea level, in the Samtskhe-Javakheti district, spending time in the Armenian villages of Eshtia, Ujmana and lastly Bavra. The images here are from our travels and focus on Eshtia and its parish priest, Father Anton. The 12th man from his family to serve as priest and a native of the village, he described life in the village, which is totally made up of subsistence farmers, who lack running water, roads and anything resembling what we call recreation. They work, eat and sleep. Over a beautiful lunch prepared by his wife, he told us how the community was placed here by a Russian general in the 1830’s, how the Turks invaded in 1915 and spared this village while others were wiped out, and the guilt the old-timers still feel. The day was cold, wet and muddy. I saw few people, as most are leaving this gorgeous but hard land. Meet Julia Sirinian, a teacher, community leader, translator and journalist. After meeting several families, taking coffee and sweets with one in particular, I see why she is so passionate about a place neglected by almost everyone.